I offer a framework to analyze and evaluate Atlantic Yards (in August 2014 rebranded as Pacific Park Brooklyn) and the Barclays Center: Atlantic Yards, Pacific Park, and the Culture of Cheating. Remember then-Gov. David Paterson at the March 2010 groundbreaking for the Barclays Center? "To those who have supported the project and to those who opposed the project," he declared, "I guarantee that we will be scrupulous in our monitoring of the contract that Forest City Ratner signed with the state to make sure that everything we were promised, we receive." There are several ways to look at that statement, which seems tilted to monitoring the project's benefits, though of course Empire State Development, the state agency overseeing/shepherding the project, has not pointed out the less-affordable nature of the subsidized housing. Nor did it proactively make public the mold and water-infiltration problems with the B2 modular tower. As to the regular complaints and concerns regarding construction impacts, state officials like to say incidents are "closed," though that doesn't necessarily mean much. Florida financier Julian Rubinstein is fighting back after Rao’s regular Charles Gargano told us Rubinstein’s story that he bought Gargano’s Rao’s table for charity — then was stiffed — is full of baloney. The red-sauce row thickened when Rubinstein shot back: “I researched my e-mails and found that Nick Mastroianni III — who was running for and won [Leukemia & Lymphoma Society] man of the year — got Gargano to donate the table.” Mastroianni III’s dad, Nicholas Mastroianni II, is president of US Immigration Fund, where Gargano’s executive director. “Nick provided all of Gargano’s contact info — I certainly didn’t get Gargano’s cell number from Google,” Rubinstein said. Mastroianni III told Page 6 that Gargano did donate his Rao’s table to the Leukemia & Lymphoma Society, but had already promised the table to another cancer organization. The site — home to ramshackle car washes and repair joints — is opposite the McDonald’s and the Pacific Park project. Up the block, a 2012-era rental at 525 Clinton has shown the area is ripe for modern apartments.Actually, this is the north side of Atlantic Avenue, at Vanderbilt Avenue, opposite McDonald's and catercorner to the Atlantic Yards/Pacific Park site. It's currently occupied by Atlantic Hand Wash at the corner and other auto uses. There's a lot of traffic, of course, but the neighborhood is changing. The Pacific Park building at that corner, B10, is tentatively scheduled to open in 2019, the first tower to be built on a deck over the Vanderbilt Yard. "Beware of China's Safety Record," in Brooklyn? Beware of China's Safety Record, opined Chinese novelist Murong Xuecun in the 11/26/15 New York Times, regarding accidents in Chinese industrial buildings, construction sites, and mega-engineering projects, including nuclear power projects. "There’s no reason to expect the safety standards and the quality of building to be higher in China-run projects abroad," he wrote, citing the management role of "Chinese state-owned companies," work done by "imported, low-paid Chinese laborers," with management by "mainly Chinese government appointees." He citesdincidents in Vietnam and Ecuador, as well as information control from Chinese authorities. Should that impact how we think about Atlantic Yards/Pacific Park? Chinese investors have been particularly aggressive at using a federal visa program called EB-5 that allows overseas citizens to put $500,000 to $1 million into a project that will create at least 10 jobs. Investors can get a green card in about two years. So far this year, 86 percent of the EB-5 visas issued worldwide have gone to Chinese. Ha! It should be "that will purportedly create at least 10 jobs." The 11/27/15 tweet below from Pacific Park Brooklyn represents remarkable hubris: "Investing in complicated #infrastructure makes for the biggest public benefit." Do keep in mind that the 2005 deal to build a modernized replacement Vanderbilt Yard to store and service Long Island Rail Road trains was revised, at Forest City Ratner's request, in 2009, and accepted by the Metropolitan Transportation Authority. The permanent railyard, instead of having nine tracks with capacity for 76 cars, will have seven tracks with capacity for 56 cars. While there would be several improvements, the new railyard would be valued at $147 million, while the MTA's Gary Dellaverson in 2009 said the previous iteration could be worth $250 million, after inflation. According to the Living Social deal web site, there are some big discounts for Monday's New York Islanders game against the Colorado Avalanche, which is not exactly a premier opponent. That's $35 for two tickets, via the re-seller Venue Kings. Note that typically sellers on sites like Living Social and Groupon take home 50% to 60% of the fee. Surely some tickets on these resale sites come from season ticketholders, but I have to believe some are quietly put on sale by the venue itself. On the Venue Kings website itself, tickets start at $9.96. Is that a better deal overall?? Holiday discounts at the Barclays Center. Lots of them. Remember, pricing for Barclays Center events, including many Brooklyn Nets and New York Islanders games, is variable. Below is a partial screenshot from a recent promotion, offering 30% off selected basketball and hockey games. Yes, it may seem churlish to look critically at the Brooklyn Nets' recent charity/media event, helping give out Thanksgiving turkeys and other food to needy families via the Bed-Stuy Campaign Against Hunger. After all, it does short-term good, helping hundreds of needy families, and shows the basketball players in unselfish mode. But really, do you think the Nets would do this without the reciprocal promise and expectation of significant media coverage (aka "earned media")? 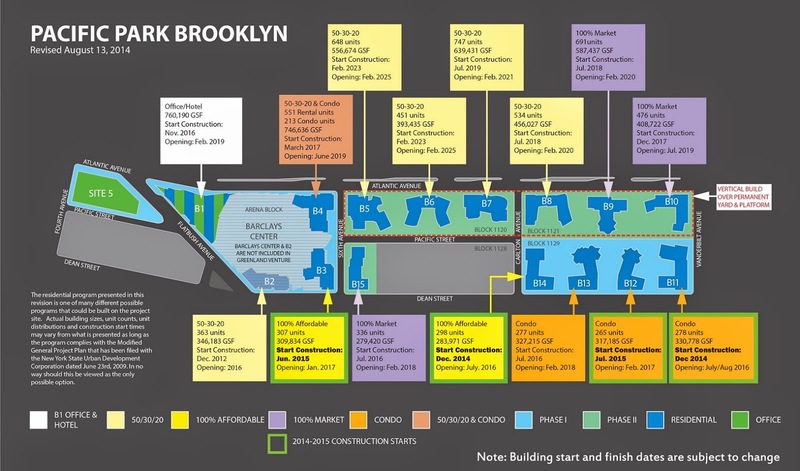 So, what's the source of dust coming from the Atlantic Yards/Pacific Park construction site? According to the video shot today by resident Wayne Bailey, dust is coming from dumpsters at the 535 Carlton construction site, which extends out into the street, between Dean and Pacific streets. That means the dust not only streams out to passers-by, it starts pretty close to the houses across Carlton. The 5 am concrete pour has been rescheduled to Saturday, it seems. Why the weekend work? Remember that 5 am concrete pour at the B3 site that was supposed to happen yesterday? It didn't happen, for reasons unexplained. Now it is likely to occur this Saturday, with up to 90 trucks accessing the tower construction site at Dean Street and Sixth Avenue, beginning at 5 am, according to the Community Notice below. There's no explanation why a weekend, when neighbors might want to be sleep late, is acceptable when, presumably, there are five other days in the week when the pour might occur. Please be advised of the possibility that on Saturday, November 28, 2015 contractors will be working beginning at 5AM throughout the day on a large concrete pour relating to 38 Sixth Avenue. [The document erroneously said 48 Sixth]. This work is pending final permitting and logistics, but we wanted to make you aware before the holiday. The New York Islanders, upon their move to Brooklyn for the 2015-16 season, were not only expected to take advantage of a suite-filled new arena that would drive revenues, they were also expected to reconstitute their fan base. That was supposed to make up for the loss of some Long Island-based fans no longer willing to drive (and seek parking) or take the LIRR by drawing more from Brooklyn and the boroughs. So far, that hasn't really happened--though there are some partly plausible explanations. According to ESPN, the Islanders are averaging just 12,407 people per game, 28th in the 30-team league, in the arena with the league's second smallest capacity, 15,795, which includes some very bad seats. That's 78.5% of capacity, 25th in the league, while in their final season at the Nassau Coliseum, they averaged 15,334 fans, or 94.8% of capacity. Contractors for developer Greenland Forest City Partners today began hand demolition of two-story 495 Dean Street, one of two 19th-century houses long owned by the family of Jerry Campbell, which were taken via eminent domain (with the financial compensation yet unresolved, as far as I know). Campbell was evicted in May from the neighboring, three-story house, after he lost title via eminent domain. The two-story building, which had lost its roof and most of the second floor by the time I stopped by, is one of three houses left on a 100-foot stretch east of Sixth Avenue that was claimed, as best as I could determine, not because blight magically attached to that parcel. Rather, at least in initial plans, developer Forest City Ratner planned to use the entire lot between Dean and Pacific Streets for construction staging when the arena was being built simultaneously with four towers. Ok, the Atlantic Avenue crane for the Barclays Center green roof was supposed to be disassembled this past Friday overnight, ending at 10 am Saturday. That didn't happen. Rather, the work--I'm not sure when it actually began--was finished yesterday afternoon and early evening, according to photos taken by resident Wayne Bailey, and flatbed trailers were waiting along Atlantic Avenue, including a bus stop. Bottom line: we need a real-time update of construction activities from Atlantic Yards/Pacific Park developer Greenland Forest City Partners, as well as Empire State Development, the state authority overseeing/shepherding Atlantic Yards. We also need responses to Bailey's monitoring, including reports yesterday of a mysterious smell outside the 666 Pacific Street site, which is being prepared for demolition. Prokhorov counsels patience, avoids questions about Nets' attendance, etc. The Record asked Prokhorov about several problems hanging over the Nets, including their lack of future first round draft picks; the drop-off in attendance. Prokhorov was also asked if he’s worried the Nets might lose fans to the suddenly-surging Knicks, and if his franchise missed an opportunity to gain traction with New York fans over the last few years when the Knicks were struggling. But Prokhorov did not address any of these questions in the email. Instead, he sent a message of patience for his struggling team. Devin Kharpertian of the Brooklyn Game suggested that Mikhail Prokhorov’s most interesting answers were the ones he didn’t give. A college basketball tourney at Barclays. A "very sparse crowd." For the 51 NBA scouts and personnel executives in attendance — a significant portion of the very sparse crowd that partially filled Barclays Center’s lower bowl Monday night — it was a glimpse of what [LSU's Ben] Simmons, an Australian who is projected to be one of the top picks in the 2016 NBA draft, is capable of. So how many people attended the FanDuel Legends Classic last night? The overall attendance was not reported. Yes, it was a cold night. And a Monday night a few days before a holiday. And maybe the problems with FanDuel, a big-spending fantasy sports site that suspended its New York operations in the wake of a cease-and-desist order from New York State Attorney General Eric Schneiderman, played a part. It hasn't made big headlines yet, but a significant change is percolating in Albany, where the Joint Commission on Public Ethics (JCOPE) is proposing to require "strategic consulting firms" like BerlinRosen and SKDKnickerbocker--which, respectively, work for and have worked for Atlantic Yards developer Forest City Ratner--to register as lobbyists. Some of New York’s most successful “strategic consulting” firms – such as Manhattan-based BerlinRosen and SKDKnickerbocker – have close relationships with politicians who are their campaign clients, and also represent interests with business before these clients. But their employees hardly ever register as lobbyists. Forest City's Gilmartin in Businessweek: "What I Wear to Work"
Rarely does a document appear that might be consulted in so many of our academic and evening programs: Gender Studies, Real Estate Development, Executive Leadership, Work-Life Balance, Luxury Brand Building, and Personal Shopping.Please see, fromBloomberg Businessweek, What I Wear to Work: Forest City Ratner’s MaryAnne Gilmartin: The real estate CEO shows her feminine side." Please note that Gilmartin's "nebbish" predecessor/boss Bruce Ratner did not provoke as many avenues for discussion. According to the latest two-week Atlantic Yards/Pacific Park Construction Alert (below), for the two weeks starting Monday Nov. 23, a potential 14-hour job--the pouring of the center mat foundation for the B3 tower at Dean Street and Sixth Avenue--could begin at 5 am. The Construction Alert, which is often issued on the day it's dated, or even the day after, was circulated yesterday by Empire State Development after preparation by Greenland Forest City Partners. Surely they recognized that they had to get the word out ahead of time. But shouldn't this minimal amount of lead time be routine? Is funding for affordable tower (535 Carlton?) on hold? In another apparent dispute between Gov. Andrew Cuomo and Mayor Bill de Blasio, the governor has threatened to cancel funding for federal tax-exempt bonds that would finance the mayor's affordable housing plan, multiple sources have confirmed. A Community Notice (below) circulated yesterday by Pacific Park Brooklyn indicated that Atlantic Avenue outside the Barclays Center will be narrowed starting "overnight hours" Friday (unspecified_ through 10 am Saturday to accommodate the belated (see below) disassembly and removal of the crane used to work on the arena's green roof. Thus, both crosswalks across Atlantic Avenue at Fort Greene Place (from the Atlantic Terminal Mall to the plaza in front of the Barclays Center), will be closed, and both eastbound and westbound lanes on Atlantic Avenue will be narrowed, likely triggering vehicle delays. The eastbound B45 bus stop at the corner of Atlantic and Flatbush Avenues will be temporarily closed, with passengers for that bus advised to either walk 1,500 feet east to Atlantic Avenue and Cumberland Street or take the eastbound B65 bus on Dean Street at Fifth Avenue. "Thanks again for bringing this to our attention. I was informed by Barclays that there was a miscommunication somewhere between the loading dock downstairs and staff at street level managing vehicle intake. Barclays recognizes that this condition is unacceptable and is working internally to eliminate congestion build up on the arena block." This is astounding. Earlier today, the intersection of Dean Street and Flatbush Avenue was congested when an 18-wheeler simply stopped in its tracks on Dean, waiting for the Barclays Center loading dock to become free. The video below, shot by resident Wayne Bailey, lasts more than three minutes, but the situation was even longer. And as shown in the video, cars and even a bicycle were waved onto the south sidewalk of Dean Street to pass the truck. Now that Barclays has been fined again, will name on Barclays Center get reconsidered? Today, Morgan Pehme, writer, filmmaker and executive director of the good-government group Effective NY, noted that Barclays agreed to pay an additional $150 million penalty to the New York State Department of Financial Services for misconduct related to automated, electronic foreign exchange (FX) trading. That's on top of many larger fines to the state and federal agencies, as well as a felony plea. In other words, an elected official need not call for a name change. Rather, they should just ask for contracts to be enforced. Something doesn't compute. Check out the chart below from Forest City Enterprises' Form 10-Q, filed with the Securities and Exchange Commission 11/3/15. That's $104,842 per space, which is off the charts, and seemingly twice that of peak numbers in the city. I asked Forest City for any explanation, but didn't get an answer. Massaging history: principal in raising EB-5 funds for Atlantic Yards claims all projects "are in poor areas of Brooklyn..."
Well, the deception continues, as talk about EB-5 rises, given that a key aspect of the program is up for Congressional renewal next month. And the deception is on video, as I describe below. Remember, under EB-5, immigrant investors who care more about green cards than investment return offer low-cost loans of $500,000 that purportedly create or retain ten jobs each. Developers reap low-cost financing and middlemen take their cut. Yes, this is a year old, but I didn't catch it, and it's worth remembering. Developers Envision Hotel, Housing and Retail at Crown Heights Armory, DNAinfo's Rachel Holliday Smith reported 10/20/14 on proposals for the Bedford Union Armory in Crown Heights. Throughout the meeting, EDC officials said repeatedly that they would take the community's input into consideration and contrasted the process with what Downing called "the elephant in the room," the Barclays Center. “One thing I want to be very clear about is that this is going through a different process. The Barclays Center project went through a state process that did not require as much community input,” she said. Still true. There are all kinds of ways to sell tickets, and at different prices. So notice two lower-level ticket vouchers, available via Costco, to see the Nets or the Islanders for $144.99, or $72.50 per seat, up to 31% savings. The Nets and Islanders tickets are also available online from Costco. The only Nets games excluded involved the Cleveland Cavaliers, New York Knicks, and the Detroit Pistons (the day after Christmas). It's worth noting that, while the Islanders promotion shows captain John Tavares, the Nets promotion shows a DUMBO scene with the Manhattan Bridge in the background, as if an identification with the borough can still cut it. There's something a little confusing about the Asbestos Abatement Notice posted outside 666 Pacific Street, at the corner of Sixth Avenue, a building slated for demolition for the B15 tower (aka 664 Pacific). It indicates that the work schedule is Monday through Sunday, 7 am through 11:45 pm. That's quite different from the previous notice, 7 am to 7 pm Monday to Saturday, which was up last Sunday when work was going on, disturbing neighbors. However, neither late-night work nor Sunday work were indicated in the Construction Update issued Monday, Nov. 9, by Empire State Development (ESD) after preparation by Greenland Forest City Partners. I queried ESD yesterday as to why, but didn't hear back. I'll post an update if and when I learn more. Among The New Players of Commercial Real Estate and CRE Finance--25 lenders and debt brokers under 35 in the region, and 30 leasing, sales, development and investment professionals under 30 years in the city--is Elizabeth Canela, 27, Senior Project Manager of External Affairs Division at Forest City Ratner Companies. She doesn't address the public at meetings, but she's around, part of the team led by External Affairs Senior VP Ashley Cotton. The profile notes that Canela, who began at Forest City some two years ago as an intern, interviewed 30 people a week to re-staff the modular factory at the Brooklyn Navy Yard after Forest City's split with Skanska. Some 80% of the workers are minorities, and 11% female, and Canela, who grew up in the Ingersoll Houses, is tracking NYCHA residents. "Creating access and opportunities in real ways is important,” she said. Canela's achievement is worth noting. The ongoing relationship between the Brooklyn Museum and the city's real estate high-flyers is under fire, as artists and anti-gentrification activists are protesting the museum's willingness to rent space to the Sixth Annual Brooklyn Real Estate Summit, an industry event.